From Coal To Code: A New Path For Laid-Off Miners In Kentucky : All Tech Considered The state's coal industry is shrinking fast; more than 10,000 workers have lost their jobs since 2008. 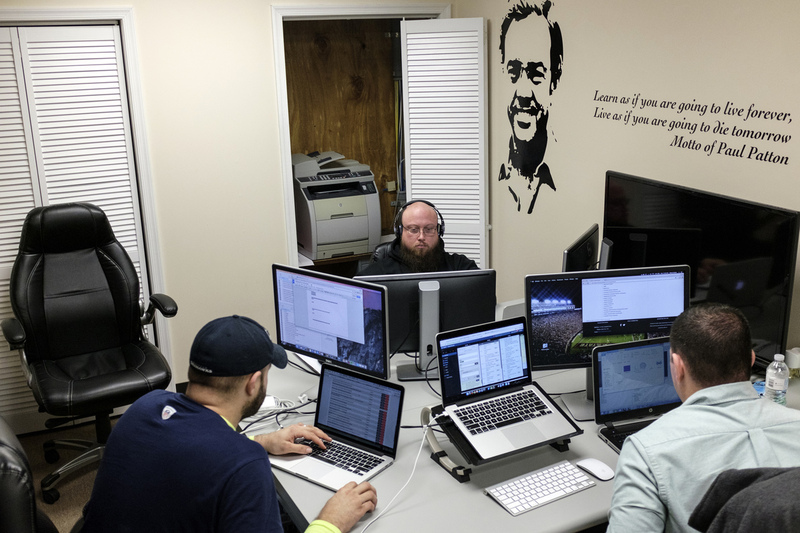 A small firm in eastern Kentucky is turning unemployed coal workers into software developers. Software coders (from left) William Stevens, Michael Harrison and Brack Quillen work at the Bit Source office in Pikeville, Ky., in February. The year-old firm has trained laid-off coal workers to become software coders. All over eastern Kentucky, you see cars and pickup trucks with black license plates proclaiming the owner is a "friend of coal." Even though the license plates are all over, it's getting harder to find actual coal miners here: Fewer than 6,000 remain in the state, where the coal industry is shrinking fast. More than 10,000 coal workers have been laid off since 2008. Many have had to leave the area to find work, but a few have found employment in other — and sometime unexpected — fields, as businesses are innovating to use former coal workers in new ways. Rusty Justice's company is one of these. "The realization I had was that the coal miner, although we think of him as a person who gets dirty and works with his hands, really coal mines today are very sophisticated, and they use a lot of technology, a lot of robotics," says Justice, who has worked in the coal industry all his life. Justice is one of the owners of Bit Source, a year-old tech startup in Pikeville, Ky. He owns another company in eastern Kentucky, too — an engineering and excavation firm that relies on the coal industry for most of its business. But with an eye on his bottom line, a few years ago Justice felt he had to diversify. And after lots of research, he and his business partner settled on coding, with the aim of tapping the region's workforce of laid-off coal miners and teaching them a new skill. He put up ads, and got nearly 1,000 applicants. Ten were hired; of those, nine remain. We're not shipping coal out of here anymore; we're shipping code. The broadband's our highway, our shipping lanes, our trains. Inside Bit Source's headquarters, the nine Web developers sit around MacBooks, writing code. All of them used to work in the coal industry. After 22 weeks of company-provided training, six former coal miners and three industry support workers became coders. Garland Couch used to be a maintenance manager for coal companies, until he lost his job in 2014. Like most coal industry jobs, his paid well. Before he got the call from Bit Source to become a developer, Couch says, he figured he'd have to leave the region to support his family. "The entire Appalachian area, if you're not working in the coal industry, then the wage that you're going to make is substantially reduced," he says. "If you're going to earn a decent living, then you're having to look to move." Robin Webb, a state senator, represents several eastern Kentucky counties and is a former coal miner turned lawyer. "Eastern Kentuckians value family and the area, and they want to stay home and they should be able to do that," Webb says. "I think that's our goal as policymakers, to ensure that they can." In the past, politicians focused on improving the region's asphalt infrastructure, building two- and four-lane highways to eastern Kentucky. They blamed the struggling economy on the topography: mountains and forests that necessitated spiderweb networks of long, winding roads. But now, Bit Source manager John Handshoe says for companies like his to thrive, eastern Kentucky needs a different type of infrastructure. "We're not shipping coal out of here anymore; we're shipping code," he says. "The broadband's our highway, our shipping lanes, our trains." The region's Internet speeds lag when compared with most other cities, though a state-funded project is working to bring broadband to the region. Leaders in the area see the project as crucial to creating a new Appalachia. For them, the region's future relies on lots of smaller industries and employers, rather than one gigantic one like the coal industry. It's a big change from the way things were done in the past. Bit Source owner Justice points to the old-fashioned mine equipment hanging in the building's entry. "Our slogan is 'a new day, a new way,' " he says. "And it's a new day here in Appalachia and we're trying to do things a new way." And as Justice says, it's not necessarily a new way for the rest of the world, but it's new for eastern Kentucky.